With the number of skin cancer cases on the rise, awareness, sun safety and early detection remain vital. Despite growing awareness of sun safety, cases of skin cancer continue to rise with the disease now affecting two in three people under 70 – people aged 50+ particularly at risk. While skin cancer comes in various guises, melanoma is the most serious of all, responsible for 75% of all skin cancer deaths. There are two types of moles – common and dysplastic. A common mole is a controlled growth on the skin that develops when pigment cells grow in clusters. A dysplastic mole is often large, does not have a symmetrical shape and can have two or three colors. Although people with dysplastic moles are at higher risk of developing melanoma, most dysplastic moles do not turn into melanoma. Most of us have moles, with adults having between 10 and 40 common moles. These growths are usually found above the waist on areas exposed to the sun. They are seldom found on the scalp, breast, or buttocks. The more moles a person has, the higher the risk of melanoma. It is IMPORTANT that you visit your GP or dermatologist to have them investigated further. 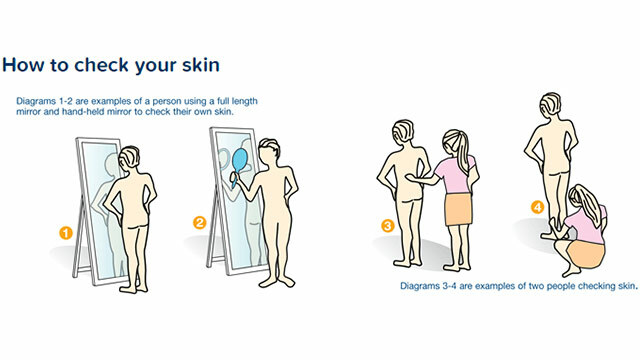 Your GP can discuss your skin cancer risk and advise you on your need for medical checks or self-examination. Melanoma is a type of skin cancer that begins in melanocytes (a cell in the skin and eyes that produces and contains the pigment called melanin). Most melanocytes are in the skin, and melanoma can occur on any skin surface. The scary issue with melanomas is that they’re cancerous cells that can escape and be carried to other parts of the body in blood or lymph vessels. Undress and stand in front of a well-lit, full-length mirror. 1. Starting with your face, look for asymmetrical spots with uneven borders or colour, or any spots larger than 7mm. 2. Part your hair into small sections and thoroughly check your scalp in the mirror. 3. Check your hands and arms, including your palms, as well as under your nails and armpits. 4. Inspect your neck, chest and torso. Use a hand mirror (or get someone to help) to check your neck and shoulders. 5. Inspect your lower back, buttocks and the back of your legs. Finish off with your feet, checking under toenails and heels. Replicated with permission of Cancer Council Australia. B is for Border – A spot with a spreading or an irregular edge (notched). Protect yourself from UV rays and regularly check skin for changes. It can be difficult to know whether something on your skin is a harmless mole, normal sun damage, or a sign of cancer. When in doubt, speak to your dermatologist or GP.